Ortuzar Projects is pleased to present Raul Guerrero, an exhibition featuring works made between the 1970s and 1990s. Raul Guerrero (b. 1945) has been exploring identity and culture through his practice for over four decades. Guerrero attended Chouinard Art Institute in the late 1960s, where he became influenced by a generation of Los Angeles artists that had investigated the regional environment, including John Baldessari and Ed Ruscha. Working alongside friends such as Allan Ruppersberg, Jack Goldstein and William Leavitt, Guerrero’s practice articulated his position as a Mexican-American artist in Southern California. Having grown up in National City, California, ten miles from the US/Mexico border, Guerrero’s work is informed by his early awareness of cultural plurality. Raul Guerrero highlights the artist’s conceptually-driven work in photography, painting, printmaking, video, and performance. Influenced by an early interest in Marcel Duchamp, Rotating Yaqui Mask, 1973, illustrates a seemingly simple détournement of a cultural artifact loaded with personal significance for Guerrero. 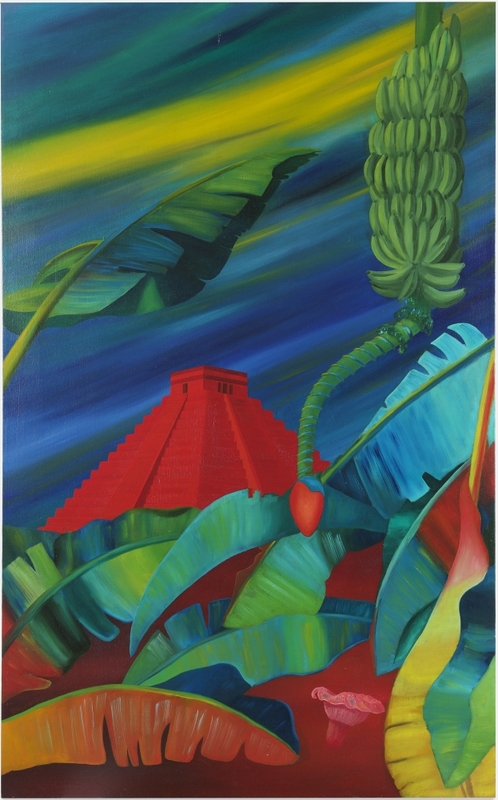 The exhibition features four paintings from his landmark 1985 Oaxaca series, a surrealist envisioning of Pre-Columbian civilization. Also included are two photographic series: a 1972 group of works employ a documentary mode to depict a trip to the Baja peninsula in Mexico; the street culture of Mexican-American Los Angeles is represented as both text and image in Obscene Hand Gestures, 1973. Two of Guerrero’s video works are included in the exhibition, as well as a selection of works on paper. Raul Guerrero lives and works in San Diego, CA. He has been exhibiting his work since 1974 with solo shows at Los Angeles galleries including Cirrus Gallery, Thomas Lewallen, Claire Copley and Richard Kuhlenschmidt. Guerrero has had solo exhibitions at the San Francisco Art Institute (1976), the Long Beach Museum of Art (1977) and the Athenaeum Music and Arts Library (2007 & 2013). His 1989 retrospective exhibition was presented at the Museum of Contemporary Art, San Diego. Guerrero’s Oaxaca paintings were the subject of an exhibition at the CUE Art Foundation, New York in 2010, curated by Allen Ruppersburg. Guerrero was the recipient of an NEA Photography Fellowship (1979) and the San Diego Art Prize (2006). His work has recently been included in exhibitions at Air de Paris Gallery, Paris (2015); Chateau Shatto, Los Angeles (2018); and Honor Fraser, Los Angeles (2016). His work will be the subject of an exhibiton at Potts, Los Angeles from July 8-September 16, 2018.